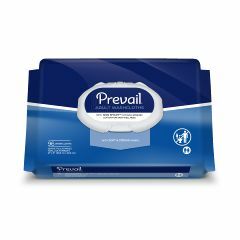 Prevail Washcloth Bathing Wipes are made with Super Strong and Super Soft fabric. Single Hand Dispensing ensures that a single, unfolded wipe dispenses each and every time for added convenience and less waste. Used as an incontinent wet wipe to clean the skin. Alcohol free, containing aloe and lanolin to improve skin care and comfort. Made of thick soft non-woven fabric. The pop-up single hand dispensing design eliminates cross contamination of other wipes. The lid closes tightly with an audible click to maintain product moisture. Stay Open and Easy Close Lid: Lid stays open without extra touching, reducing the risk of cross contamination. The larger holding area in the lid provides additional space for the next washcloth so the lid will close every time. An audible click reassures the Caregiver the lid is completely closed preventing washcloth dry-out. Press N' Pull Lid: Press N' Pull Lid is a one touch design and features First Quality's ultra convenient Single-Hand Dispensing. Not Greasy. Moisturizes. Soothes Skin. Breathable. Not enough moisturizer on. too difficult to remove . They were too dry and they were very hard to remove from the tub that they were in! I have a Colostomy bag which I have had for many years, We have used every type of powder, ointment to try to take care of this painful condition. One day being curious I cleaned the area around my Stoma with it. I cleaned and then laid another clean one over it, while I cut the bag to size. I have not had a red sore day since that time.I hope this may help someone else with this problem. Comfortable. Protective. Discreet. Not Greasy. Moisturizes. Light. Soothes Skin. Daily Use. Emergencies. Cleansing. Home. Travel. Office. Long Term User. Quality Oriented. These are the best pre-moistened washcloths I have used and I have tried several brands. I prefer the fragrance free because I have delicate skin but the fragrance is not too bad, kind of smells like baby powder. Definitely a staple I always like to have around. Protective. Comfortable. Breathable. Soothes Skin. Not Greasy. Moisturizes. Soothes Skin. Daily Use. Cleansing. Home. Travel. Use with Adults I care for and the large size makes it easier to clean. The case of 576 wipes come in a number of 6 tubs of 96 wipes each. It is described in the information given about the product.